Dirk Jacobs, professor at the Université Libre de Bruxelles and affiliated to research center METICES of the Institut de Sociologie, has been granted a SCIENTIFIC IMPULSE MANDATE by the national fund for scientific research (FNRS) for the project “Ethnic social capital and its impact on generalised trust and political participation among ethnic minority groups “ ( 2008 – 2011 ). The project is equally financed by the Fond d’Encouragement à la Recherche (FER) of the Université Libre de Bruxelles. You have reached the project website. Dirk Jacobs, professeur en sociologie à l’Université Libre de Bruxelles et membre du centre de recherche METICES, Institut de Sociologie, vient d’obtenir un MANDAT D’IMPULSION SCIENTIFIQUE de la part du Fonds de la Recherche Scientifique (FNRS) pour le projet “Le capital social ethnique et son impact sur la confiance généralisée et la participation politique parmi les groupes de minorités ethniques” ( 2008 – 2011 ). Le projet est également financé par le Fond d’Encouragement à la Recherche (FER) de l’ Université Libre de Bruxelles. Ceci est le site du projet de recherche. Especially since the work of Putnam (1993) the concept of social capital has been increasingly in vogue as a crucial explanatory variable for political trust and political participation (see Paxton, 2002). Social capital – defined here in a strict sense as being embedded in a social network through associational life – is thus seen as an important factor influencing the level of political trust and the intensity (and even the quality) of political participation (both formal and informal) of citizens. One would, in fact, learn to be democratic through participation in civic associations, as Toqueville already argued in the 19th century. Not only could one question this social capital hypothesis on general grounds but one should also pose the question as to whether this link is cross-cultural, cross-national and univocal. (1) Ethnic communities which constitute a stronger ‘civic ethnic community’ (i.e. groups who have a higher civic participation level and a more densely connected ethnic associational arena) will have a higher level of political trust and a higher level of political involvement. The latter hypothesis is based on the idea of diffusion of trust through informal social networks, organised around ethnic identity and cultural affinity. Civically active individuals would ‘contaminate’ non-civically active individuals in an ethnic minority group with their trust level. (5) ethnic voluntary associations which are densely connected with other organizations create more social trust (leading to political trust and political involvement) than less connected or isolated organizations. (6) bigger ethnic associations create more trust (spilling over into political involvement) than smaller associations. The underlying idea here is that, as a member of an association, one has access to the (informal) social capital of other members, but also to the social capital of the organisation as such. Several elements of the theory of Fennema & Tillie have been tested in a number of settings, with varying, and at times contradictory, outcomes (see Jacobs & Tillie, 2004). In our own research (Jacobs, Phalet & Swyngedouw, 2004) we have, for instance, shown that only hypothesis 3 holds in the Brussels context, but that hypotheses 1, 2 and 4 have to be refuted. All these hypotheses were, however, confirmed in the Dutch case. One could say that the final verdict is still out. Does ethnic social capital lead to higher trust levels among ethnic minorities and facilitate their socio-political integration in the host society? If Fennema & Tillie are right, then ethnic social capital should, of course, be fostered and stimulated. Do ethnic associations indeed function as bridges towards the dominant ethnic groups in mainstream society? Or do they, as some policy makers argue, in contrast rather lead to the institutionalisation of ethnic entrenchment in divided societies? Perhaps they are just neutral and do not hinder nor facilitate (political) integration, because other variables (economic capital, language knowledgeability, cross-ethnic interaction patterns) are far more important. This research project has the ambition to (help) settle the question, making use of cutting-edge empirical research combining both quantitative as qualitative methods in a mixed research design, combining survey research, network analysis and in-depth organisational studies. We will specifically focus on the research question if there is a link between (the lack of) embeddedness of ethnic organisations in an ethnic associational network on the one hand and (the lack of) political participation (by and through ethnic organisations) on the other hand. This issue is not limited to the field of ethnic studies but has a larger relevance for social sciences. To our knowledge, the more general hypothesis that voluntary associations which are densely connected (on the elite level) with other organizations create more social trust (leading to political trust and political involvement) than less connected or isolated organizations, has not yet been formally tested in a convincing and direct manner. We aim to do so in this research project, by focusing on the specific case of ethnic associations. The broader theoretical relevance is that it allows to test the hypothesis that social capital can ‘travel’ and that trust is ‘contageous’; not just in networks of individuals (in organisations) or in networks of elites (between organisations), but also through the elite network (across organisations) to members of other organisations. Fennema, M. and Tillie, J. (1999) ‘Political participation and political trust in Amsterdam. Civic communities and ethnic networks’, Journal of Ethnic and Migration Studies, 25(4): 703–26. Fennema, M. and Tillie, J. (2001) ‘Civic community, political participation and political trust of ethnic groups’, Connections, 24(1): 26–41. Paxton, P. (2002) ‘Social capital and democracy: an interdependent relationship’, American Sociological Review, 67 (2): 254-277. Putnam, R. (1993) Making Democracy Work. Civic Traditions in Modern Italy. Princeton NJ: Princeton University Press. Tillie, J. (2004) ‘Social Capital of Organisations and Their Members: Explaining the Political Integration of Immigrants in Amsterdam’, Journal of Ethnic and Migration Studies, 30 (3): 529–542. Let us try and explain more clearly what this means in terms of research agenda. 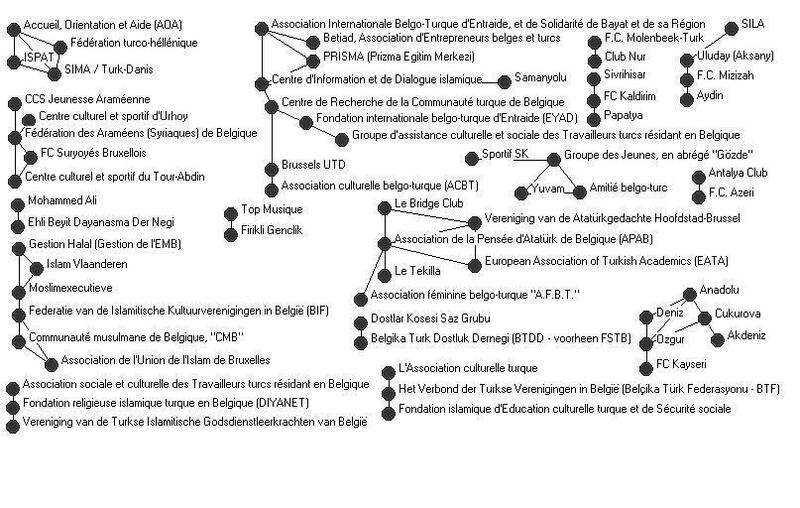 The above figures represent formal interlocking directorates between on the one hand ethnic Moroccan organisations with other Moroccan associations (on the left) and on the other hand ethnic Turkish organisations with other Turkish associations (on the right) in Brussels. Completely isolated organisations are not shown in the figures, we only show those that are connected with at least one other ethnic organisation. 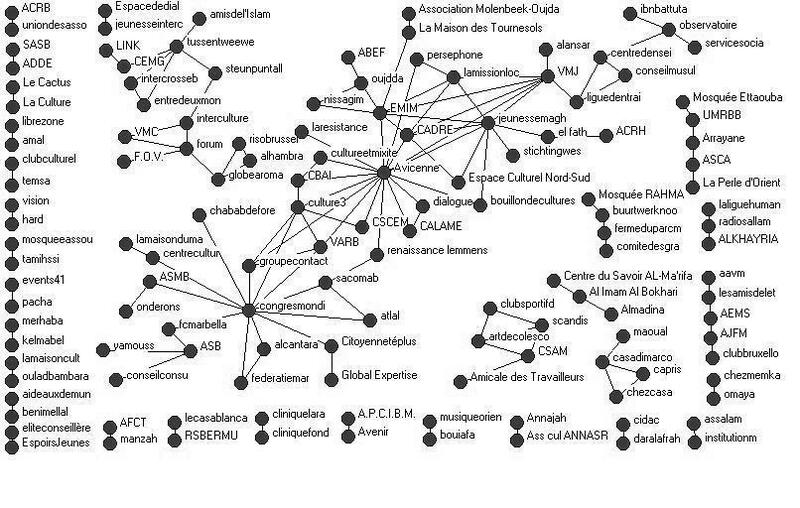 It is clear that the Turkish ethnic organisational network structure is much more fragmented than the Moroccan one. One might now hypothesize that the more densely interconnected part of the Moroccan associational life is more effective in resorting political involvement than the more fragmented Turkish associations. We can do the same exercise comparing Moroccan associations linked to Belgian associations on the one hand with Moroccan associations which are not cross-culturally connected on the other hand, or we can compare a Turkish organisation which is isolated in ethnic terms with a Turkish organisation which is isolated in cross-ethnic terms, etc. (c) A survey research among a representative sample of ethnic minority groups (of Moroccan, Turkish and Congolese origin) in selected neighbourhoods in Brussels (and non-immigrant persons living in the same neighbourhoods). If additional funding allows it, there will additionally also be targeted samples of members of different types of ethnic organisations. Although the organisational survey, network analysis and survey research will deliver research results which are interesting on their own, the most exciting and innovative part will be the combined analysis of the different data sources. This will allow us to assess the impact of embedded organizations against isolated organisations on political involvement, which is our main focus of interest. We will however equally be able to assess whether also other structural network properties (such as centrality within a network, etc.) of organisations have an influence. (d) A qualitative study of different types of ethnic associations, entailing open interviews with members and leaders of different kinds of organisations and participant observation at their activities. In sum, the project wants to assess the impact of ethnic social capital on political involvement using a mixed-method design. Team members will, consequently, have to collaborate closely.